We need your help to protect the health of our communities! 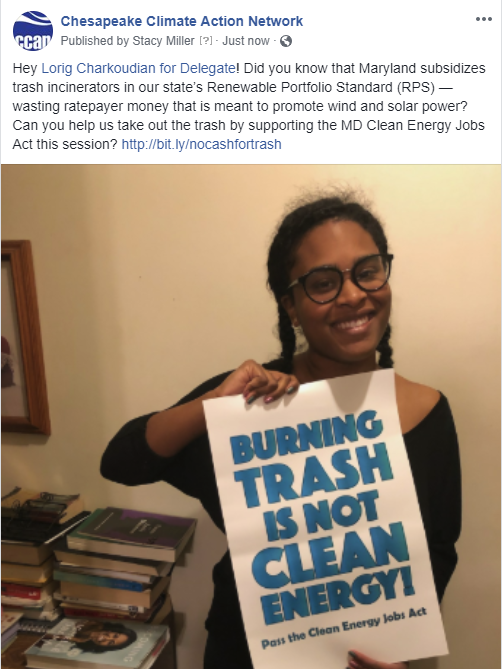 If you live in the Baltimore area, you may know of the BRESCO trash incinerator. This incinerator has long been a threat to the health of Baltimoreans and the Chesapeake Bay. Incinerators like BRESCO release harmful pollutants like NOx and PM 2.5 as byproducts of the trash incineration process. These pollutants can cause lung damage, chest pain, and increased risk of heart attack for people living nearby. They are also bad for aquatic life in the Chesapeake Bay, causing harmful algal blooms which end up depriving other organisms of oxygen. However, this year the Maryland General Assembly will be voting on whether or not to pass the Clean Energy Jobs Act. This bill could be monumental for Maryland! Under the Clean Energy Jobs Act, Maryland would have to meet a goal of 50% renewable energy by 2030. This means that 50% of Maryland’s electricity would come from renewable energy sources like wind and solar, and we’ll pave a path toward 100% renewable energy by 2040. 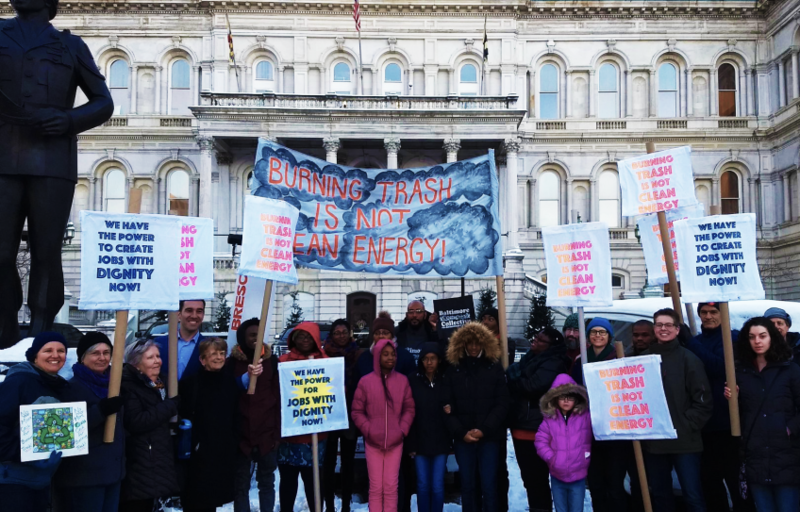 To meet this goal, the bill would also require investment in clean energy job training, investment in clean energy businesses owned by women, people of color, and veterans, and, importantly, the removal of public subsidies for trash incinerators. You can read more about the Clean Energy Jobs Act here. So, how can you help us get this landmark bill passed? Simple! We need you to spread the word about the Clean Energy Jobs Act far and wide through social media. All you have to do is take a picture of yourself with our downloadable sign, share our message through the post, and tag your friends, family, and legislators. Follow our instructions below to learn out exactly how to do it! Step 1: Print out this sign, and take a picture with it! Make sure to get your best angle! Step 2: Tell your story + post the picture on social media to boost the message! Step 3: Tag your friends, family, and legislators! Tag the people you know and ask them to get on board! 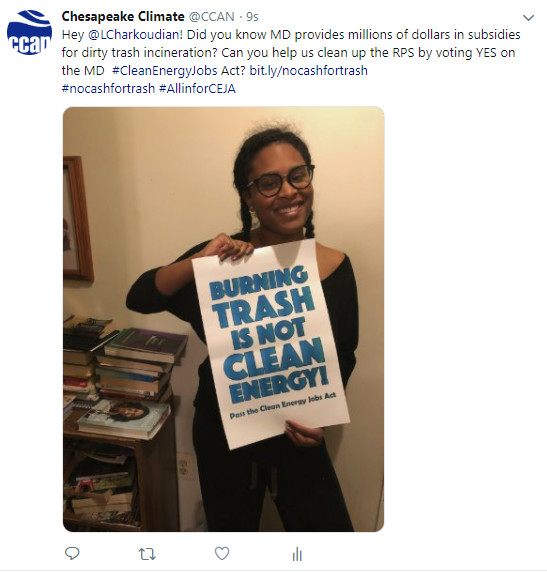 Ask your friends and family to sign our “No Cash for Trash” petition (link: http://bit.ly/nocashfortrash), and encourage them to make their own photo petitions. And make sure you make your post viewable by the public and tag us so we can see your post! 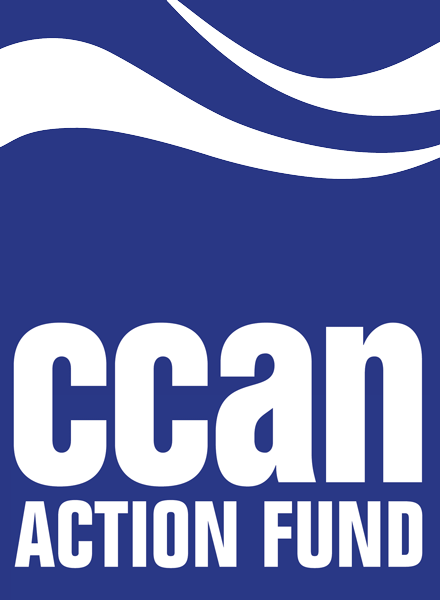 Tag us at @CCANActionFund, @ChesapeakeClimate on Facebook and Instagram, and @CCAN + @CCANActionFund on Twitter.